Milan is the second largest city in Italy and the capital of Lombardy. The city’s urban area is the 5th most populous in Europe, with approximately 5.2 million people. Milan is considered the world fashion & design capital and is home to important museums and landmarks including the Milan Cathedral and Santa Maria delle Grazie. The gay scene in Milan may not be as open as in other large European cities, but it is more visible than elsewhere in Italy. 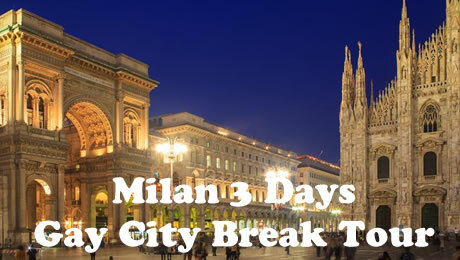 Milan is a global fashion hub and the financial capital of Italy. These industries have acted as a gay magnet for gorgeous Italians, and a new generation of men now live their lives proudly out in the open. Signs of affection such as holding hands, hugging in the street and kissing cheek to cheek are perfectly acceptable. Milan’s main gay nightlife used to be centred around Via Sammartini street, near the Milan Central Station. Today, while a few gay venues remain on Sammartini, the Milan gay scene has made a new home in Porta Venezia district, particularly on Via Lecco street. The gay bars here (LeccoMilano, MONO Bar among others) are located within easy walking distance of each other. In Italy, to enter most gay adult clubs (cruise clubs, saunas, etc. ), you will need a membership club card such as ANDDOS. You can purchase this card from any participating venue. You will need a photo ID that shows your date of birth (passport/driving licence) to purchase a card, which is valid for three months. • Free time for shopping or individual visits. • Lunch on your own tasting local specialities. 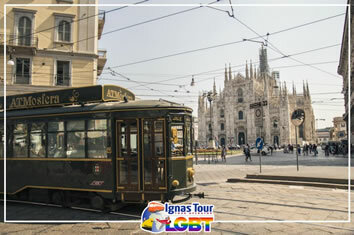 • In the afternoon together with your LGBT Friendly Guide, you will discover the magic and the secrets of the city! 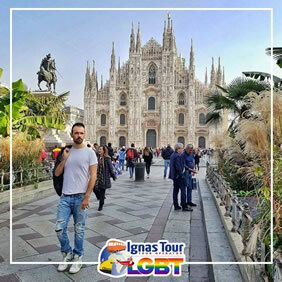 • Walking shared tour with LGBT friendly guide. Enjoy an exclusive tour in the heart of Milan with a guided visit of the La Scala Museum and Theatre, the Galleria Vittorio Emanuele II and Piazza Duomo. The Teatro alla Scala was built in 1776 on the ashes of the old Ducal Theatre and at the beginning of the following century it became the home of Italian opera thanks to the great work of Gioacchino Rossini. After the visit to the theater tour will continue with a wonderful walk in the heart of Milan's famous Galleria Vittorio Emanuele II, built in the second half of the nineteenth century and considered one of the world's oldest shopping malls. From here you get directly into the majestic Piazza Duomo, with the equestrian statue of King Vittorio Emanuele, the beautiful Palazzo Reale and the Palazzo dell'Arengario and of course the magnificent Gothic cathedral. The tour will end at the Duomo Market: the guide will accompany you there and then you are free to explore this 500-square-meter indoor space, where you can lose yourself among scents and flavors of local products and raw materials in the heart of Milan. Showing our voucher, you will be entitled to 10% discount on any product for sale in the Market! Rainbow Tips: We can provide you Exclusive Tickets for Gay Clubs with special prices ! Day 3 - Milan & Good Bye! AC Hotel Milano is 300 m from Porta Garibaldi Station, offering links to Rho Exhibition Centre, and excellent tram links around Milan. The air-conditioned rooms include satellite channels and a minibar. WiFi is free throughout. Guests at AC Hotel Milano have access to complimentary online newspapers and to the fitness centre with free mineral water. This impressive black skyscraper is near Milan's business and fashion districts. From the hotel you can reach FieraMilano exhibition centre in just 15 minutes by train. Milan Central Station is just 2 stops away on Line 2 of Milan's Metro. Monumentale Metro station (Line 5) is within walking distance of the property. Breakfast is buffet style and the AC Lounge restaurant serves a selection of Italian and international dishes. It is open at dinner, and at lunch for groups on request. Room service is available from 07:00 until midnight. La Residenza is an eco-friendly hotel with a garden and restaurant, located 300 m from Affori Centro Metro Station and 2 km from Bovisa Train Station. It features a café serving organic food and drink and free WiFi throughout. The hotel has private parking on site, available at extra charge. Malpensa Airport is a 35-minute drive away. Eco-Hotel La Residenza uses sustainable energy, low-voltage light bulbs, and recycled paper. Air conditioning, a flat-screen TV and minibar are provided in all rooms. The large buffet breakfast includes organic products, and gluten-free products are available on request. Specialities made with local and organic produce can be tasted at the on-site restaurant. It also offers vegetarian, vegan and gluten-free options on request.